It needs work. That’s the first thing I’ll say about PC Building Simulator, now that we’ve spent some time with it. The game’s site calls it a pre-alpha build, but even that’s a pretty generous term. It’s more like a proof of concept. But oh, what a wonderful proof of concept it is. Building a PC is intimidating. Not difficult, per se. It’s essentially “match slot A with part A” a dozen times, wire it all together, and voila: Functioning PC. The ideal solution is, obviously, to know somebody who’s built a PC. Ask them for a hand, have them watch out for any beginner errors. Don’t know anyone? Well, PCWorld’s PC building guide can walk you through the entire process. The /r/buildapc subreddit is another great resource, and YouTube tutorials can be a huge help. But all of those guides are hands-off. You read about or watch somebody else build a computer, rather than learning through interaction. That’s where PC Building Simulator comes in. As you might expect from the title, PC Building Simulator simulates the building of your very own personal computer. The current demo is very limited, giving you a preset number of parts and having you slot them together a bit haphazardly—for instance, fastening the CPU into the motherboard when it’s already in the case and standing vertically. Don’t try this at home, kids. The cable management tutorial included at the moment is also rather awkward and pretty limited. There’s a ton of potential in PC Building Simulator, though. Some of the parts included are already brand-name parts, like an Nvidia GeForce GTX 680. Outdated parts, sure, but one can imagine a future in which all (or most) recent hardware is available through the in-game store, at which point you could buy and assemble a virtual build that matches your own real-life build. Throw in some basic tutorial instructions walking you step-by-step through the process and this could be huge for first-time builders. The hardest part of building your first PC is reading instructions and then visualizing what needs to go where. This removes that uncertainty, letting you grasp the fundamentals of building in a no-risk environment. You don’t need to worry about accidentally damaging your pricey computer parts in a digital simulation. But as far as the basics are concerned, it’s incredibly helpful to have a visual. Seeing where the standoffs will go in your case, for instance, or where a graphics card slots into a motherboard. We don’t even need to limit it to first-time builders. There are plenty of people, even longtime PC users, who could benefit from this tool given enough polish. Maybe you’re eyeing a new GTX 1080 Ti and are worried it won’t fit in your case. Sure, you could look up the measurements, do it the hard way—but imagine if you could just load up PC Building Simulator and test it. There are all sorts of features I’d love to see added. Cable routing, of course—though that’s probably the hardest aspect for the developers to accurately simulate. Right now the cables just sort of...appear in the box. Some sort of way to track whether your power supply is robust enough to run two graphics cards would be nice, or a way to see what RAM slots your own personal motherboard prefers. Adding all that detail would be a huge undertaking, and one that would require a lot of number-crunching and polish on the part of the developers. But I’m serious: There’s a lot of potential here. Building a PC can be intimidating, but mostly because it’s unfamiliar. Giving people a chance to “practice,” so to speak? 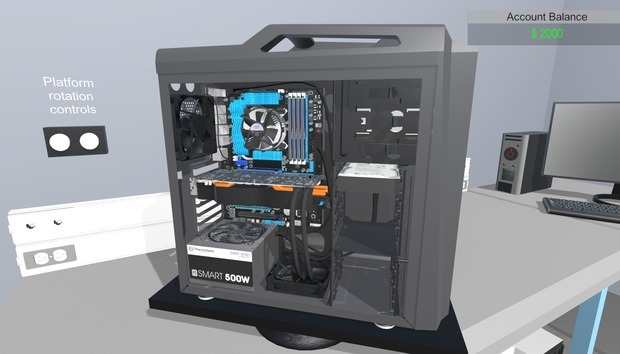 PC Building Simulator could be an excellent educational tool. Who knows, maybe it’ll even scratch that computer constructing itch a bit for the people who’re addicted to putting together dream builds on PCPartPicker. If you want to give the PC Building Simulator demo a spin, check out the game’s itch.io page or the developer’s own website. We’ll keep you updated if the game ends up in a more polished state.